We all know the past is the era when kitchens were used to be stuffed with baking oven, a toaster and a separate microwave heating oven. 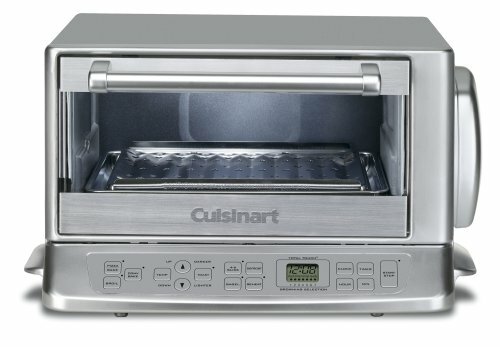 For this TOB-195 Toaster Oven Broiler, I think Cuisinart has made it possible to replace all the above three with just one TOB-195 Toaster Oven Broiler where cooking has been made easier by providing baking, toasting and broiling all in one place, on the countertop of any kitchen. This product is empowered by Cuisinart with features of some great technologies including Exact Heat, Total Touch and Always Even, which makes baking and toasting easier. It’s definitely one of the ultimate desires of every household. This product is a beast from the power rating perspective. 1500 watts of power makes it a pretty powerful cooking appliance and hence it is able to heat up to temperatures of 500 degree centigrade making it possible to cook, bake or roast almost anything. Whether it is pizza and roasted chicken or those sweet apple pies or cream cakes; everything is done with this oven by two in one baking technology of Pizza Bake and Convection Bake. It also offers toast, broil, bagel, reheat and defrost functions. Choose yours accordingly and enjoy both types of baking right in your kitchen. Now you can time your cooking pace accordingly and set the oven to reach your desired temperature while preparing pizza base or topping or marinating your chicken. Oh and for the good part, the oven will notify once it has reached the set temperature by sending beeps to call out for your food to get cooked. Cuisinart fills this amazing product with a capability to memorize up to 7 toast browning settings. It also gives you the privilege to overwrite these settings and customize according to your own choice to achieve perfect crisp and bread browning of your desires. Browning selection is displayed at the LCD display which is also a key feature of this product to help let you know how much intense your browning is going to be. Custom settings can be set for slice toasting, bagels, defrost, reheat and combination of any other, with the privileged Total Touch technology giving your toasting a next level of taste and presentation. Another outstanding feature of this Cuisinart TOB-195 toaster oven is its capability to evenly distribute heat for cooking by Always Even Shade control technology blessed by Cuisinart. This not only keeps a check on the temperature but also electronically adjusts the temperatures at right places to give an even more uniform cooking experience. Multiple heating elements make it possible to provide uniformity in the temperature distribution in this oven. What Do Owners Say About The Cuisinart TOB-195? Quick Heating – The quick heating function of this toaster oven broiler is praised as a great expert over the others of its kind by most owners. The usual ovens take a lot of minutes to heat up before you can even start putting things in them; this however gets heated up within a few minutes hence saving both time and energy and proves to be quite economical from this point of view. Moreover the convection baking and excellent insulation allows this oven to retain heat for longer time periods and saves energy from this point of view as well. Easy Cleanup – Owners also love the convenience brought by this even heat toaster oven, which comes with a nicely finished nonstick interior that makes it pretty easy to clean once you are done with cooking. The removable crumb tray and baking and or drip tray also proves to be very convenient when you are cleaning this oven. Space Saving – Besides, most owners love its smart design for saving space. The control panel and LCD is fitted just beneath the front main cooking housing of the oven which saves a fair amount of space on the counter top as compared to the rest of oven which have this thing fitted on side of the main compartment. This is indeed a great feature if you are tight on space perspective on your counter top. Control Panel – The control panel overall is a best made feature, the keys are labeled in a readily understood design and easy to operate. The LCD is also of good quality and provides fairly visible display during operation. Extra Convenience – Another minor but comparatively handy feature loved by users of this product is its cord storage which allows the oven to store the power cord within its body when not in use. This saves those hassles on your kitchen countertop. The oven rack has a safety catch allowing the tray to only slide half way and be removed by pulling up further if required. This allows user to safely remove the food and avoid any risks of burning by spilling or falling of hot food right from the oven. Hot Front Door and Top – First and foremost is the heat it produces. There’s no doubt that this oven does reach 500 degrees unlike all the others which only claim to be. It does in real and indeed is a great pro but owners complained that the front door and the top of the oven get very hot. Be careful here when you are touching the door, and make sure using protection like mitts etc., which is highly advised. No Interior Lamp – Secondly, the oven interior does not have a lamp which makes it a little difficult to look at the food while it is being cooked. So if you are trying a new recipe where you do not know the exact heating or baking time, you should be monitoring regularly or might need to recook from the start due to overcooking or even burning. Some Inconvenience – There is one little problem with cleaning of this oven. The crumb tray is removed from the back, which makes it a little hassle while you are cleaning it since you have to turn it all the way back to get that crumb tray out of it. Another little problem is the timer. The timer is a nice thing and beeps to notify on both reaching the desired temperature at start of cooking and also when timer runs out. However it does not turn off the oven, so you have to keep out an ear for that beep. The control panel is fitted just below the door opening leaving a potential for it getting messed up due to food spilling but it is covered nicely and is easy to clean making it no problem. No doubt that this toaster oven broiler has got cons but is a really great product for its price due to excessive cooking options and nice design. It has a high rating on online stores and is also one of the featured products recommended by myself. If you have a small family then this is the thing to buy rather than wasting your money on buying different machines for different cooking where this specific Cuisinart can do all jobs in one. The large capacity of this oven allowing baking pizzas at home makes it a good choice for all those food lovers out there.